Right around the time I closed the back cover on Scott Pilgrim Volume 1, I went right out and bought Volumes 2-5. I’d have bought Volume 6, but it doesn’t come out until July. I am hoping I survive that long. The withdrawal might not be pretty. These books, at least the first two, are so fun it’s like eating ice cream in the sunshine while watching your favorite band play. Or whatever it is you think is a lot of fun to do for a couple of hours. 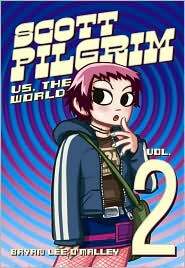 In Volume 2, Scott Pilgrim vs. The World, our favorite Canadian hipster doofus is back and in love. Scott and Ramona’s relationship seems to be progressing even with the spectre of the seven evil ex-boyfriend lurking around them. Oh and Knives Chau, the seventeen-year-old high school student Scott hasn’t exactly broken up with yet. ExBFs are the least of Scott’s worries in this volume. Sure he has to duke it out with evils exBF #2, an action-movie hero former skateboarder. Lucas Lee, is a cross between Jason Lee and hrmmm . . . who is an action-movie hero? Tom Cruise? Matt Damon? I don’t know these things. It’s the Jason-Leeness of the character I picked up on. It’s the ExGF’s Scott really needs to worry about here. They’re after Ramona and his heart. What I liked so much about Volume 2 is that we start to see some character development and even differentiation. We learn a bit about Scott’s past and how his band started. We learn a little bit about Ramona, not just what she tells us but through her exBF. I hope this trend continues throughout the series. Another thing Brian Lee O’Malley does in this volume is give the characters real emotional depth. We see Scott filed with remorse over breaking someone’s heart and the angst he feels when an one of his most dreaded former girlfriends calls him. It’s nice that this isn’t all video game-style battles and indie-rock t-shirts. There seems to be some actual emotion which makes the stories even more fun to read. Four more to go, and I can’t wait. You’ve been warned.